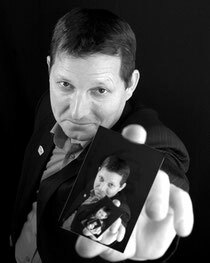 Otiz Cannelloni combines the illusion of magic and the logic of stand up to produce a hybrid comic creation. With a mind more suited to testing crash helmets, his performance fluctuates between sheer genius and downright stupidity. Just when you suspect he doesn’t have a clue, Cannelloni removes all doubt. Despite various television appearances – The Stand Up Show BBC 1 - Stuff The White Rabbit BBC 2 - producers are prepared to forgive and forget, mostly forget. Still, there’s always the cruise liners.